Editor's note: This Veterans Day, we’re celebrating our veteran’s contributions and successes as entrepreneurs, by highlighting a handful of the 3.7 million businesses run by veterans in the U.S. Today’s guest blogger is Jonathan Hudgins, Co-Founder and CEO of Flying Scarfs, an enterprise that empowers partners in developing countries to flourish in the global economy. 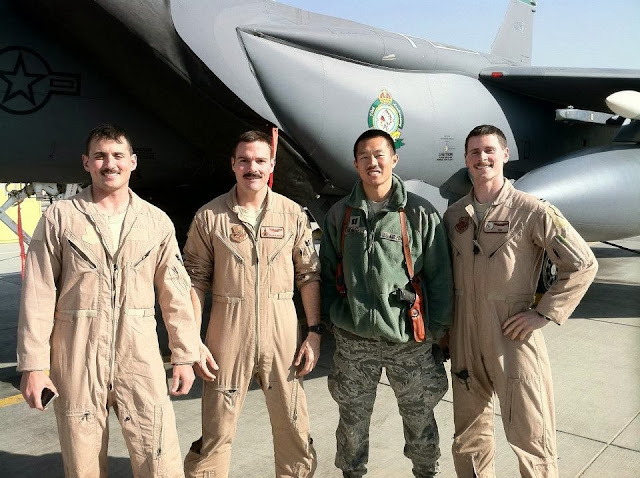 When I deployed to Afghanistan with the 335th Fighter Squadron in the summer of 2011, I didn’t expect to return with an idea for a nonprofit, much less a plan for making it a reality within months of getting home. But that’s exactly what happened over the 6 month stint. During my time in Afghanistan, I spent days exploring the local Bagram bazaar with three of my fellow Air Force Officers and future co-founders, Joseph Stenger, Joshua Carroll and Ryan Bodenheimer. We befriended a merchant who was selling scarves made by widows in the area, then giving the proceeds back to the women so they could educate and support themselves. These women typically didn’t have much access to capital or jobs, so this gave them some financial stability — and with, a stronger political voice. As our deployment came to an end, we realized there was an opportunity to stay connected with and support the Bagram community by selling their scarves back in the U.S. and sending the proceeds back to the women who made them. By sharing their creations with a broader audience, we could stay connected with the community while also helping the artisans achieve economic success and stability. That’s how Flying Scarfs got started. We had the idea, the business plan, the connections in Afghanistan, and even a retail store, my parents’ shop in North Carolina, to sell our first batch of scarves — the next step was finding a tool to connect the dots. Google Apps was our answer from day one: we could appear professional right off the bat with our @flyingscarfs.com email, and with the cloud-based storage and email, we didn’t even need an office. That was essential at the time, since Joey, Josh and Ryan were still on active duty and we were all in different locations. With Google Apps, we could still stay connected and up to speed no matter where we were. Two years later, we’re grown up and are even more spread out, but with Google Apps, we’re always on the same page, whether it’s on Gmail, Docs or Spreadsheets. Our CFO, for example, keeps a master financial spreadsheet that gives the rest of the team visibility into our expenditures, costs, sales and margins. We review it each quarter, but if an odd charge shows up at any point, he can ping us and ask if we know where it came from. We can just add details to the Notes column in the spreadsheet, and voila, everyone else knows where it came from. Hangouts have become an equally integral part in keeping the team up-to-date on the latest updates and developments, both on a regular basis and for ad hoc meetings. When ABC World News published a piece about us in August, for example, our daily website traffic suddenly increased by 100 times our average and our order requests from our online store shot up. We were all over the place — our CFO was in Chicago, Ryan was in Idaho, Josh was in DC, and the rest of us were in North Carolina — but by jumping on a Hangout, we were able to outline a clear plan for handling the sudden activity. A phone call doesn’t always do the trick when you’re trying to replicate the kind of brainstorming you’re able to do when you’re together in a room, while a Hangout was exactly what we needed to plan our immediate next steps. Using Google Apps lets us to focus more on what matters to us: empowering artisans across the world. And since we’re not tied to a single desktop computer or physical office, we’ve even been able to add new partners in Kenya and Haiti and seamlessly start selling their products back in the U.S. Because that’s what it’s all about - sharing the beautiful work of craftspeople with a wider audience, so they can support themselves economically. That’s what we believe in.